Featuring a shared outdoor swimming pool, Palmeras Garden is located in Playa Blanca, Lanzarote. This property offers apartments for up to 3 people with a private terrace, and a shared garden. All apartments have 1 double bedroom and a bathroom with a bath or shower and hairdryer. Bed linen and towels are provided. Air conditioning is available for an extra cost. There is a living space with a sofa bed, safe, satellite TV and dining table, while the kitchenette is equipped with a microwave, fridge, toaster, coffee machine, and an electric kettle. You can enjoy views of the surroundings from the furnished terrace. The property has an on-site bar, and it also offers a massage service, tennis court and billiards table for an extra charge. Car hire and bicycle rental services are available. The nearest beach is a 20-minute walk from Palmeras Garden, and Playa Blanca Port, with ferry services to Fuerteventura, is 1.6 miles from the property. Lanzarote, 18, 35580 Playa Blanca, Spain, Lanzarote, Spain. 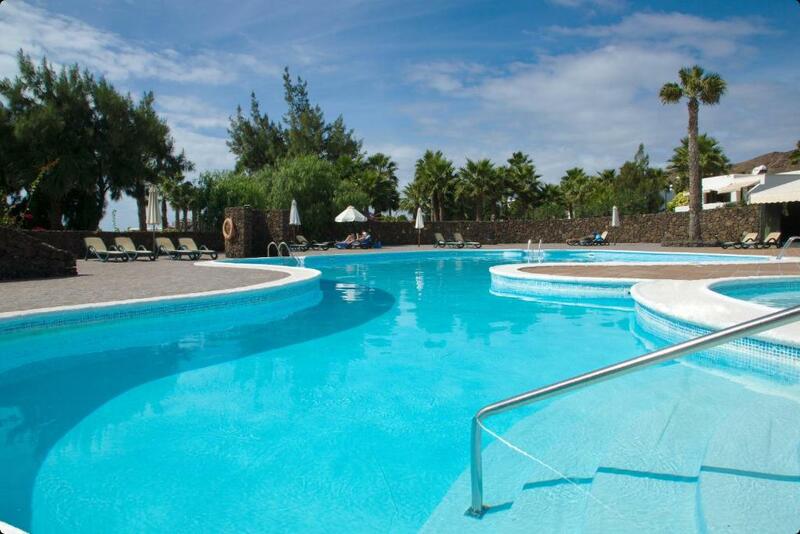 Featuring a shared outdoor swimming pool, Palmeras Garden is located in Playa Blanca, Lanzarote.